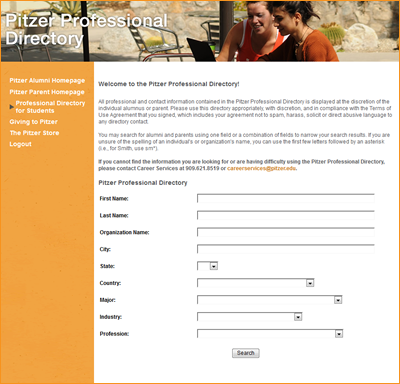 The Pitzer Professional Directory (PPD) Pitzer Professional Directory (PPD is an online, searchable database of Pitzer alumni and current parents, accessible by students for career planning and networking purposes. Only alumni and parents with active e-mail addresses and “organization names” appear in the Directory. Students can search the Directory based on a number of criteria including industry, profession, geography, Pitzer major, and organization name. To access the Pitzer Professional Directory for the first time, you will need to come into Career Services and meet with a Career Counselor. If you have met with a Career Counselor, please go to the New User Registration link. LinkedIn is the “world’s largest professional network : 300 million strong.” Although not officially affiliated with Pitzer College, we find LinkedIn useful for students connecting to Pitzer alumni. We encourage students as young as their first year at Pitzer to create a profile on the site. This allows students to start building their own professional network that they can use while they are at Pitzer College and beyond. Connections can be current and former employers, friends, family, Pitzer alumni, Pitzer faculty and advisors, as well as anyone else students know in a professional capacity. For more information on LinkedIn and to fill out a profile, visit the LinkedIn website. Join “The official Pitzer College Alumni Association.” This account is typically managed by the current Pitzer College Alumni Association President, not Pitzer College. The group will accept current Pitzer students and it will give them access to Pitzer Alumni Profiles that wouldn’t otherwise be accessible. Use the “Find Alumni” search function on LinkedIn. Once logged in to LinkedIn, select “Connections” and “Find Alumni.” If you have indicated Pitzer College in your LinkedIn profile, a list of Pitzer alumni should appear. This list is searchable by name, major, career field, college, etc. Note: the list of alumni appearing on this screen will be dependent upon your number of connections in LinkedIn (i.e. the more connections you have the more alumni appear).